It was a mixed week for the markets last week in holiday shortened trading. The S&P 500 took a breather, losing 0.22%, amid lingering concerns over global growth prospects. Contributing to those concerns last week was discouraging economic news from overseas; renewed uncertainty surrounding a U.S-China trade deal; and an increasingly tense government shutdown, which was temporarily resolved on Friday with news that there was an agreement on a continuing resolution to fund the government through Feb. 15. Despite last week's small setback, the benchmark index is still up 6.3% in January and 13.3% from its December 24 low. 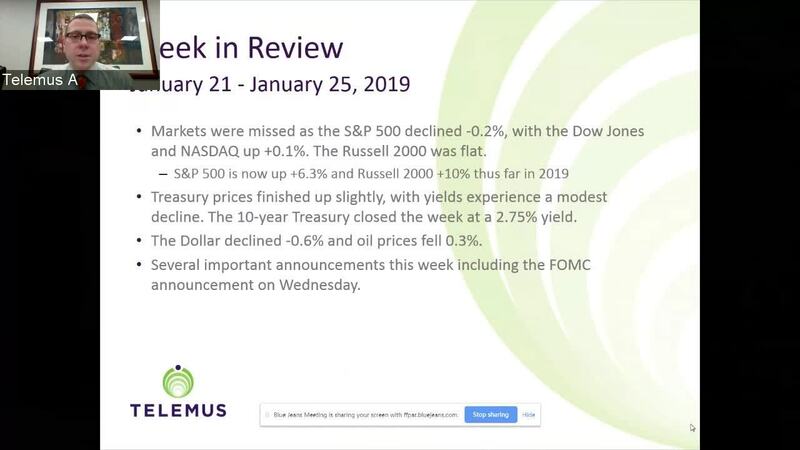 All the other markets hovered around the unchanged mark last week with the Dow Jones Industrial Average gaining 0.12%, the Nasdaq Composite 0.11%, and the Russell 2000 0.02%. The respective indices are now up 6.0%, 8.0%, and 10.0% this month. The S&P 500 sectors also finished mixed last week. The energy, consumer staples, and health care sectors all underperformed, while the information technology and real estate sectors outperformed. While there was some selling interest last week, which isn’t surprising given the years strong start, the S&P 500's 50-day moving average proved to be an important level of technical support. Also, investors had some reason to remain confident with a round of better than feared corporate earnings. Last week also featured a number of earnings releases. Generally upbeat earnings reports and forward guidance from chip stocks helped lift the Philadelphia Semiconductor Index, which featured one of its best sessions in nearly 10 years on Thursday. Intel, however, was an exception as investors responded negatively to its disappointing first quarter revenue and EPS guidance. American Airlines, Southwest, and JetBlue led the airline group to strong gains last week on the back of generally positive earnings and strong guidance. Dow components IBM, Procter & Gamble, United Technologies also reported strong results and saw their stock prices respond accordingly. Conversely, Johnson & Johnson and Travelers reported underwhelming results. In the bond markets U.S. Treasuries finished slightly higher, pushing yields lower. The 2 year yield decreased one basis point to 2.60%, and the 10 year yield decreased three basis points to 2.75%. In related news the Wall Street Journal report on Friday indicated that the Fed may be getting close to the end of its balance sheet normalization effort. The report provided some comfort for the market, which rode the belief that the Fed's de facto tightening, by way of balance sheet normalization, could soon be over. In other markets the U.S. Dollar Index fell 0.6% to 95.75 and WTI crude lost 0.3% to $53.62 a barrel.